WiFi Operating Range: Approx. 10 m/32.8 ft. 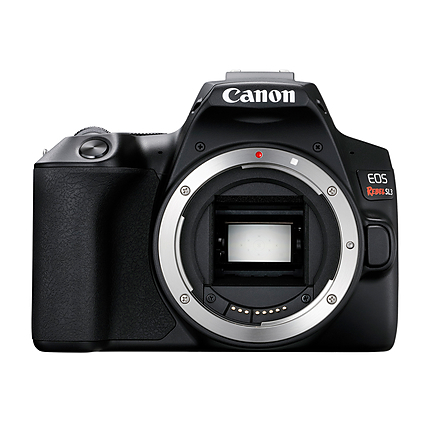 The Canon EOS Rebel SL3 Camera (Black, Body Only) is the smallest & lightest Canon EOS DSLR camera to date, & sports a compact construction, as well as comfortable grip, and user-friendly design. The SL3 includes a rounded grip that sits comfortably in your hand, while its convenient size makes it suitable for everyday use. The EOS Rebel SL3 allows for less missed opportunities, & more memories to be captured. The Canon EOS Rebel SL3 Camera incorporates an optical viewfinder, which includes a wide-area, 9-point AF system, in order to help you frame your ideal shot while achieving sharp focus in your images. The featured AF system makes capturing subjects in motion simple, even in bright lighting situations. Its 63-zone evaluative metering assists in allowing the EOS Rebel SL3 reach its optimal exposure, with a number of subjects in numerous lighting conditions. The SL3 also features Dual Pixel CMOS AF for fast & accurate autofocus, which helps you capture the shot you want at the moment happens. Its expansive focus area is approximately 88% horizontal & 100% vertical when working with select compatible EF lenses. The Eye Detection AF analyzes the image & automatically provides where to focus based on your subject's eyes, helping you capture a headshot or memorable moment with your family or friends in sharp detail. The Canon EOS Rebel SL3 camera sports a powerful 24.1 Megapixel CMOS (APS-C) sensor that can capture high-resolution images & 4K video. The SL3's sensor allows you to shoot images & video with fine details & rich colors. 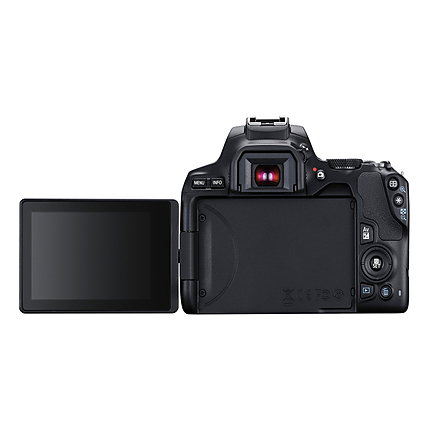 Also featured, is a 3.0" vari-angle touch screen LCD, which is ideal for setting up & reviewing your photos. You can simply tap the screen to experience "Live View" while taking photos or videos. When tapping the screen while using Dual Pixel CMOS AF, the Rebel SL3 will quickly lock focus to that area in the image. The touch screen also works with zooming, or swiping through images after you've taken them. The EOS Rebel SL3 features a menu & quick control settings, allowing you to access your settings quickly & easily. The vari-angle touch screen LCD also lets users take high-quality selfies with ease. 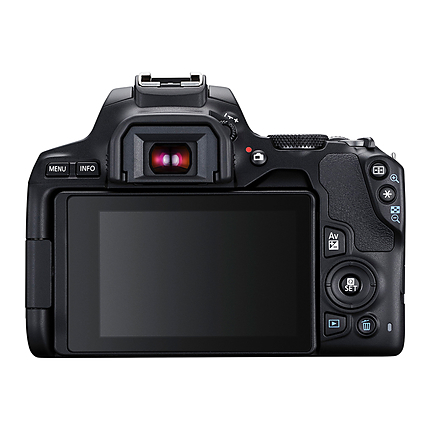 The Canon EOS Rebel SL3 Camera is designed with a powerful 24.1 Megapixel CMOS (APS-C) sensor, which allows you to capture high-resolution images, as well as beautiful 4K video. Its DIGIC 8 Image Processor & CMOS (APS-C) Sensor work together to produce high-quality images & fast operation, even poorly lit conditions. Even if you are using a high ISO setting (Range: ISO 100-25600), the image processor will help provide sharp & detailed results in virtually any lighting situation. The DIGIC 8 Image Processor also helps ensure your photos & videos look sharp and lifelike with minimal noise or grain. With the EOS Rebel SL3, you can capture 4K videos at a frame rate of up to 24p for high definition and cinematic results. You are able to record at almost four times the resolution of Full HD, allowign your subject to be captured with stunning clarity. Beautiful time-lapse videos can be created in 4K by using the "Time-lapse Movie" mode. The SL3 also allows you to use 4K frame cropping to extract still images from your video recordings. The EOS Rebel SL3 Camera makes connecting to a Wi-Fi network fast & easy. The WiFi connection allows you to exchange data with other WiFi-compatible Canon cameras, or smart devices with the "Camera Connect" app. The "Camera Connect" app allows you to transfer files directly to a smart device, providing you with the ability to share & upload, directly to CANON iMAGE GATEWAY, Facebook, and YouTube. The Wi-Fi connection also allows you to print directly to compatible wireless Canon printers (sold separately). The EOS Rebel SL3 Camera also features Bluetooth pairing, which also helps you connect your camera to compatible smart devices. The Bluetooth function allows you to customize your settings by using the "DISP" (Display) button located on the top of the camera. Bluetooth also lets you connect to the optional Wireless Remote Control BR-E1 for remote shooting, & even pick up your GPS location data from your compatible smartphone. Wi-Fi Support: WiFi Operating Range: Approx. 10 m/32.8 ft.
All digital cameras come equipped with an Autofocus, or AF Mode. While in Autofocus the camera automatically focuses on subjects based on the AF Area Mode the user has selected.